The 31 Center Console is a strong stable fishing machine in a trailerable package. The midsize model in our Center Console fleet, the 31 offers the strength and presence that all OBX Center Consoles present and the OBX hull design provides great sea keeping ability and fuel efficiency. 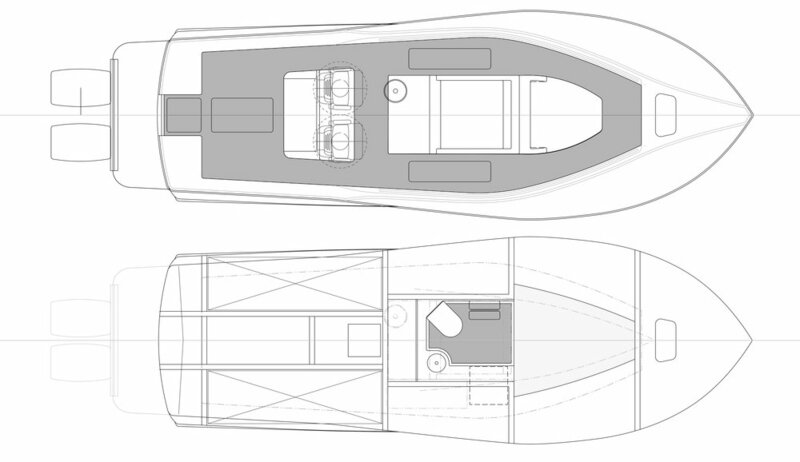 The 31 is an easy to handle boat around the docks and is at home offshore. The 31 at heart is a fishing platform but the layout and large decks provide lots of seating options, which makes it a great family cruiser. Pulling in a game fish or pulling a tuber, the 31 will not disappoint. The 31 is a great all around boat for family, fun and fishing. Our goal at OBX is to build a yacht with the finest and strongest materials available, by the finest craftsman and boat builders in the industry, with superior engineering and design, all at a tremendous value. Battery charger. Battery switches with paralleling. Custom modifications such as seating, fishboxes and live wells are always available to fit your requirements. Aluminum framed acrylic access door.